In the early 7th century there were three Frankish Kingdoms, Austrasia (in the east, mostly German-speaking), Burgundy (in the south) and Neustria (in the west). Each had its own palace, though not necessarily its own king. Many of the kings were minors when they came to the throne, achieved little and died young. Thus the mayor of the palace, or one of the other magnates, was able to serve as king. The strongest mayor or magnate tended to act in association with a young king’s widowed mother. In due course it was inevitable that a mayor of the palace should overthrow the king and usurp the throne. [PEPI121] King Clovis of Cologne m. ?
. [PEPI131] King Childebert of Cologne m. ? [PEPI121] Clovis the Riparian, Frankish King of Cologne, was living 420. [PEPI131] Childebert, King of Cologne, was living 450. [PEPI141] Sigebert I le boiteux [=the lame], King of Cologne, married Theodelinde. He died 509, and she later remarried. [PEPI151] Cloderic the parricide [=parent killer] (born c.475), King of Cologne, married [GODO173] --- (daughter of King Chilperic II of Burgundy, see BURGUNDY KINGDOM). He was murdered by agents of Clovis I (509). [PEPI161] Munderic de Vitry-en-Perthois (born c.500), Pretender of Austrasia, married 1. ---; then 2. [ARTH162] Arthemia de Geneve (daughter of [ARTH151] Florentinus, Bishop elect of Geneva & [RUST152] Artemia de Lyons, daughter of [RUST141] Bishop Rusticus of Lyon). He died 532. [PEPI171] Gondolfus (born c.530, son of Mundersic & Arthemia), Bishop of Tongres, perhaps married Palatina. [PEPI181] Bodegeisel II (born c.569), DUKE OF AQUITAINE, married his cousin Oda of Saxony. He was murdered at Carthage (582) and Oda/Chrodoare then married 2. Arnold du Schelde, Bishop of Metz. [PEPI191] Arnulf de Heristal (born c. August 582), a Mayor of the Palace of Austrasia, and afterwards known as Saint Arnulf. He married 1. ---; then 2. Dhoda/Ode/Clothilde de Heristal. He died 16th August 641. [WALC211] Walchigise (born c.611, son of Arnulf & Ode) married Valtrude. [WALC222] Valtrude de Verdun (born c.650, daughter of Walchigise) married [LUPE201] DUKE EUDO OF AQUITAINE (see EARLY AQUITAINE DUKEDOM). [PEPI202] Clodulphe (born c.615, son of Arnulf & Ode), Bishop of Metz, DUKE OF AUSTRASIA, married Goda. He died 690. Later known as Saint Clodule. [METZ192] Kunza (daughter of Clodulphe) married [SPOD191] Count Warinus (see TREVES COUNTY). [PEPI201] Ansegis (born c.602, son of Arnulf & Ode) is dealt with below under PALACE OF AUSTRASIA. [PEPI201] Ansegis (born c.602, son of [PEPI191] Bishop Arnulf, see above) married [LAND202] Begga (daughter of [LAND191] Pepin de Landen, Mayor of the Palace of Austrasia, see LANDEN). Ansegis died c.685, and Begga died perhaps 693. [LAON211] Martin de Laon ([born c.640], son of Ansegis) see LAON COUNTY for further details. [PEPI219] Pepin II the young (born 16th December 635, son of Ansegis) was "Maire du Palais d'Austrasia" (c.679), and later succeeded in taking over control of both Neustria and Burgundy. He married 1. [HUGO252] Plectrude (daughter of Hugobert of Echternach, see ECHTERNACH); then 2. Chalpaida/Alpais (a concubine). He died of fever at Chateau de Jupil-sur-la-Meuse (20th December 714). Pepin de Heristal was Mayor of the Palace of Austrasia, who reunited the Frankish realms in the late Merovingian period. He succeeded to his position in the kingdom of Austrasia about 679, and in 687 he extended rule to the other Frankish kingdoms, Neustria and Burgundy, but retained members of Merovingian dynasty as figurehead monarchs in all three. In 689 he extended his control over the Frisians, a pagan people living on the North Sea coast. His death in 714 was followed by a civil war and the succession of his illegitimate son Charles martel. [DROG221] Drogo (born 670, son of Pepin & Plectrude), is described under DUKE DROGO OF CHAMPAGNE. [TOUL241] Childebrand I (born 695, son of Pepin II & Alpais), is described under TOULOUSE COUNTY. [PEPI229] Charles martel [=hammer] (born 689, illegitimate son of Pepin & Alpais) was Mayor of the Palace in Austrasia (714-41), and married 1. [SPOD212] Chrotrud (born c.690, daughter of Bishop Leutwinus, see TREVES COUNTY, died 724; then 2. (725) Schwanahild, a Bavarian; then 3. ?Ruohaid. Charles martel was ruler of the Frankish kingdom of Austrasia (in present north-east France and south-west Germany). When his father Pepin died (714), Charles was imprisoned by his father’s widow, but he escaped (715) and was proclaimed Mayor of the palace by the Austrasians. A war between Austrasia and Neustria followed, and at the end of it Charles became the undisputed ruler of all the Franks. His greatest achievements were against the Muslims from Spain, who invaded France (732). He defeated them near at the Battle of Tours (732) in which the Muslim leader, Abd-ar-Rahman, the Emir of Spain, was killed. Charles was afterwards surnamed Martel (meaning hammer). The progress of Islam was thus checked for a time. Charles also drove the Muslims out of the Rhone valley (739), leaving them with nothing of their possessions north of the Pyrenees beyond the River Aude. Charles died at Cressy sur Oyse (October 741), and left his kingdom divided between his two sons, Carloman and Pepin, whilst leaving the nominal king on the throne. His widow Swanahild was then relegated to the monastery of Chelles. [PEPI232] Aude/Autun (daughter of Charles martel) married [HEBC241] Count Theodoric I of Auton (see SEPTIMANIA). [CARM232] Carloman (son of Charles martel & Chrotrud), Mayor of Austrasia, married --- (daughter of Alard). [CARM242] Rotrude (daughter of Carloman) married [PARI211] Count Gerard (see PARIS COUNTY). [PEPI231] Pepin III the short (born 714, son of Charles & Chrotrud) was Mayor of the Palace of the Franks (741-57). He married (c.740) [HEBA242] Judith/Bertrada/Bertha (born c.720, Jewish daughter of Eudes, see SEPTIMANIA). The nominal king, Childeric, abdicated the throne to become a monk (749) and Pepin took over control of the whole Frankish kingdom. He decided to get rid of the king altogether and assume for himself the nominal as well as real kingship of the Franks. This he managed, with the approval of the Pope (November 750). The ousted King Childeric III died c.753. 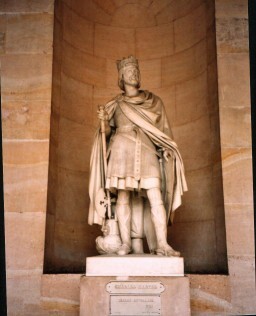 Pepin was King of the Franks (750-68). He was not of Royal blood descent though he had married a direct descendant of the King David of Israel (see HOUSE OF DAVID), thus his children (specifically Charlemagne) were of Royal blood. Pepin died of dropsy at St. Denis (24th September 768). Queen Bertrada (who was known as Bertrade with the big feet) died 12th July 783. [CARO249] David Kalonymus (Charles), Charles the great, (born April 742, son of Pepin III) is described under CAROLINGIAN HOUSE). [PEPI241] Carloman (born before 751, son of Pepin III), King of the Franks (768-71), married (769) [LOM2272] Gerberge de Lombardy (daughter of King Didier of the Lombards, see LOMBARDY (HOUSE OF FRIULI) KINGDOM). He died 771. [PEPI252] Kunigunde (daughter of Carloman) married [HEBG259] Count William I of Gellone (see SEPTIMANIA).